This was originally a Wizards of the Coast miniature with an oversized figure. I replaced the figure with an AF Sandtrooper from the Dewback set. I heavily modified the Sandtrooper and added a missile launcher (made from a Tamiya WWII machine gun) to his outstretched arm. I remodeled the legs slightly for better stability when not on the base. For the base, I added two small rods to attach to the vehicle. Painting was just a matter of using a Polly Scale Neutral Grey as an undercoat, an then masking off the green markings. For the green, I used Polly Scale Medium Green. 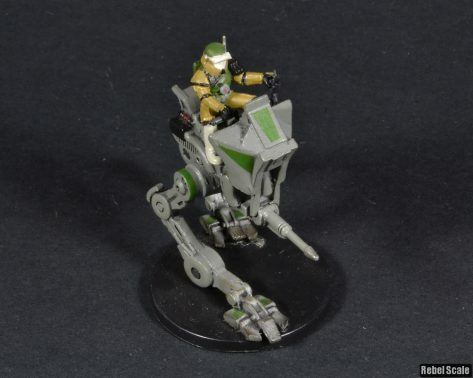 The All Terrain Recon Transport (AT-RT) became an iconic image during the Clone Wars as an open-top reconnaissance walker. 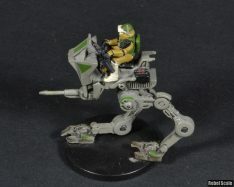 Clonetroopers trained to drive the vehicle wore full armor due to the lack of side/rear armor. 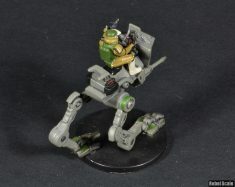 What the AT-RT lacked in defense, it made up for with lightening speed, agility, and a rapid-firing blaster cannon. 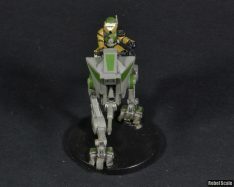 The terrain scanners, coupled with the walker’s agility, made it a favorite among Jedi for quick surgical strikes. 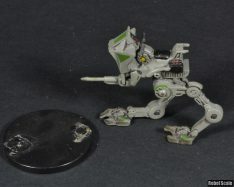 Furthermore, the entire unit could enter a crouched mode for storage in the rear section of an AT-TE, allowing for quick-deployment into battle. In addition to it’s forward weapon, drivers would commonly stow their own weapons behind their seats. 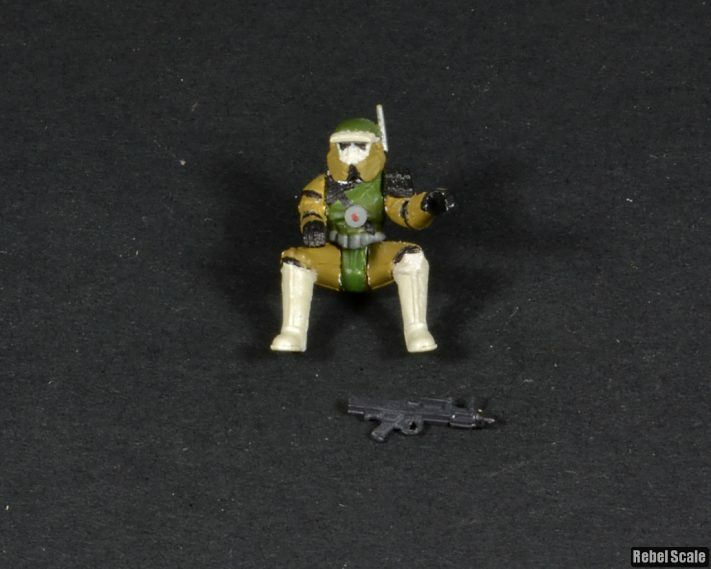 These weapons could be quickly retrieved if the Clonetrooper was being flanked. 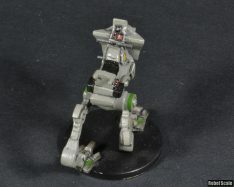 Other drivers employed use of short-range missile launchers to augment the weaponry of the AT-RT.